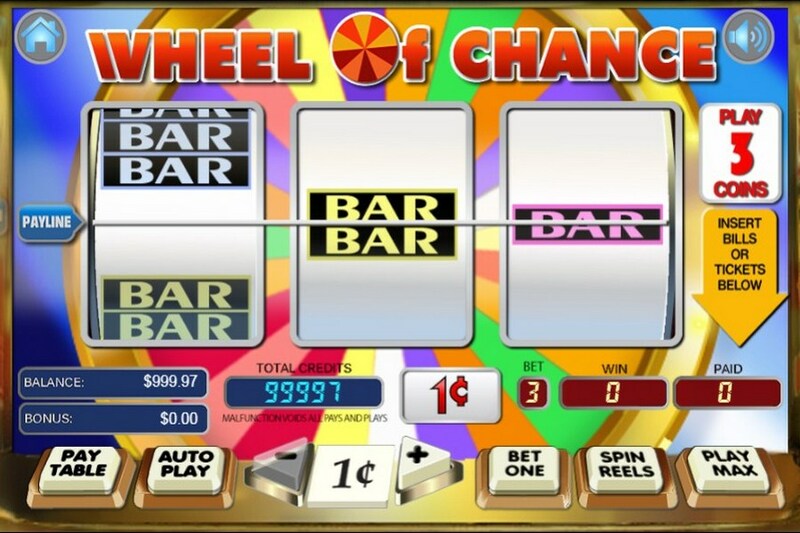 3 reel Wheel of Chance is a three reel version of one of the most popular casino slot machine games of all time and includes the famous Wheel of Chance bonus feature! This game is a single pay-line slot machine game, which means that payouts occur on the center pay-line only. For every coin that you put in, your potential payout increases. When the reels stop spinning the symbol combinations along the center pay-line are checked. You get paid out for any winning combination falling on the pay-line. If your payout is completed by 1 Wild symbol, your payout is doubled (2 x). If your payout is completed by 2 Wild symbols, your payout is quadrupled (4 x). 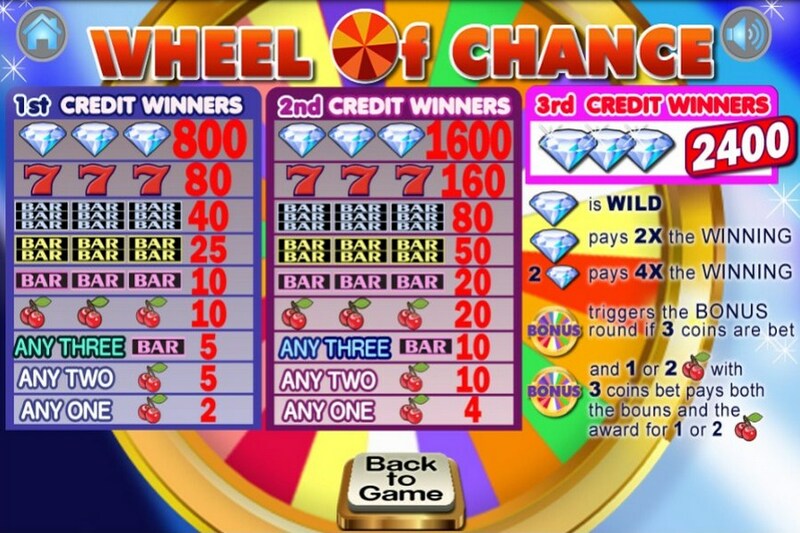 Winnings paid out in Wheel of Chance are dependent on the symbol combination that lands on the pay-line, the value of the coin bet and the number of coins bet. The total of your winnings is the number of coins won, times, the value of the coin played. Bonus game is activated when Bonus symbol appears on the center pay-line with a 3 coin bet. Bonus game will cover the entire real money casino window and all casino buttons such as Lobby will be disabled until this game is completed. You will be asked to Spin the Bonus Wheel in order to win a prize listed on this wheel. You can continue to spin the wheel until you land on a "Bust" slice or choose to Collect the winnings accumulated. A bonus wheel will appear with different prize amounts listed on it. To start, you will need to Spin the wheel. The wheel will come to stop on a slice with a prize amount listed on it. Prize amount won will be added to your Bonus round balance listed on the Top right hand side of the screen. At this point, the slice you landed on and a few other slices will turn into "Bust" slices. You will have an option to either Collect the Prize you have accumulated so far OR take your chances and Spin again. If you land on one of the "Bust" slices, all your bonus round winnings will be forfeited and you will get a consolation prize. Consolation prize is 5x your coin amount. If you land on a Prize slice, the amount will be added to your existing bonus round balance. "Bust" slices will continue to be added to the wheel after each Spin, increasing your chances of landing on one of these slices and losing your accumulated winnings. Bonus game will end if you choose to Collect your accumulated Winnings OR land on a "Bust" slice. The BET ONE button allows you to increase the number of coins being bet one at a time. When the maximum number of coins is reached, the count re-starts from one. You will have to click on the SPIN REELS button to spin the reels. The PLAY MAX button allows you bet the maximum number coins allowed by the game, and starts the reels spinning. The SPIN REELS button allows you to start the game. The + button allow you increase the value of the coin you wish to bet. The - button allow you decrease the value of the coin you wish to bet. 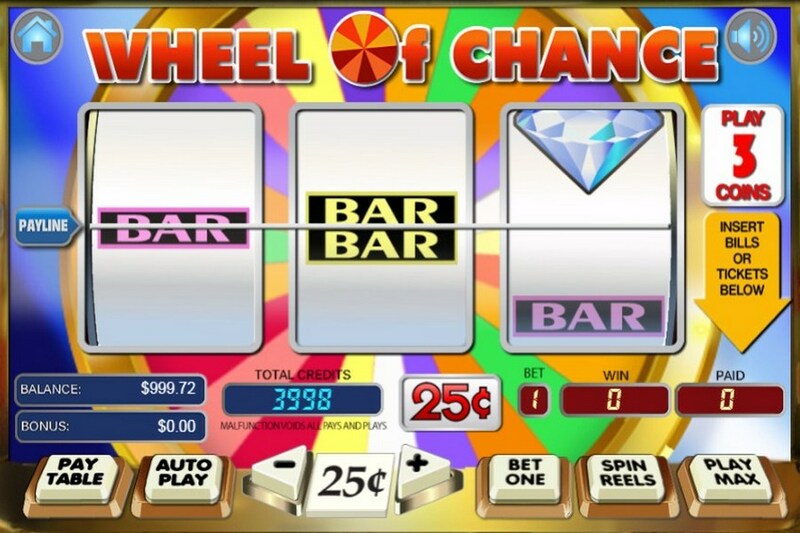 The chance to spin the wheel of fortune in a slot game is what makes 3 Reel Wheel of Chance Slots so appealing. If you want to take a chance to win big bucks, play this classic Wheel of Chance slots at real money casino Miami Club.